Venissimo Gives Meaning to "Save Your Receipt"
Okay, are you ready for this, world? Because this idea is the CHEESIEST! 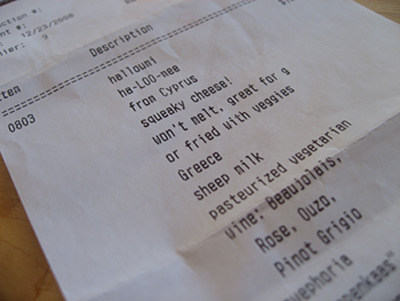 Fellow Bay Area Bites blogger Jen Maiser sent me this receipt from the recently-opened Venissimo Cheese with the note, "Thought you'd be interested in seeing this receipt from a new store in Long Beach." 1. The name of the cheese you bought: very key if you lose the little papers the cheese was wrapped in, or if you didn't lose them but were unfortunate enough to have a cheesemonger like me whose bad handwriting rendered the little cheese papers illegible. 2. The pronunciation of said cheese: in order not to embarrass yourself when you go back and reorder that "grow-YER" you enjoyed so much in your fondue. 3. The place of origin: because you might go there to get the cheese some day, and also because geography is fun. 4. The milk and treatment: because cow or sheep, raw or not-so-raw, it can matter for health reasons or just for general personal edification reasons. 5. Tasting notes: so you can impress your friends at the dinner table with just how sensitive and refined your palate is compared to theirs. 6. Wine pairing: because "What wine should I have with this?" was the question we got as often as "Where's the Slanted Door?" at Ye Olde Stanke Cheeseshoppe. Also, check it out -- they give you no less than four recommendations for each cheese! The green side of me whispers that this is probably a waste of paper -- can you imagine how long your receipt would be if you bought 4-6 cheeses? -- but the cheesemonger in me drowns that side out, because this a genius idea that serves both retailers and customers well.